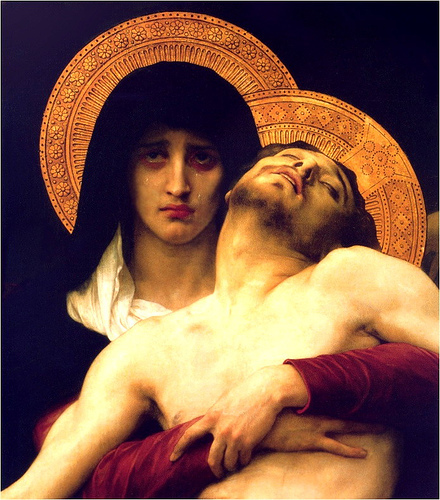 The Feast of Our Lady of Sorrows falls on September 15. This feast commemorates the sorrowful Mother and the sufferings she experienced in union with her Son and dates back to the 12th century. The feast was extended to the universal Church in 1817 by Pope Pius VII and fixed officially in the calendar for September 15 in 1913 by Pope Pius X. This feast reminds us of the spiritual martyrdom of Our Blessed Mother and her compassion with the sufferings of her divine Son. Through her great sufferings as co-redeemer, she also helps to show us the true evil of sin and thereby leads us to repentance and salvation. His mother Mary stood by Him, sharing His suffering. The feast of Our Lady of Sorrows falls on September 15; however, the prayers honoring the seven sorrow of Our Lady can be said anytime throughout the year. The devotion is similar to the Rosary, in that it consists of seven "mysteries" to be meditated on. These are the seven sorrows of Mary, the great piercings that she received throughout her life with Jesus her Son. In our meditation on the Seven Sorrows of Our Lady, we should pray to imitate the virtues and dispositions of Our Blessed Mother, especially during her moments of greatest suffering. We should seek to learn from her the value and power of redemptive suffering. Suffering becomes redemptive only through the Incarnation, Passion and Resurrection of Jesus. Because of this, each one of us can offer our sufferings as a gift to the Lord, uniting them with those of the His Son. When we do this, our sufferings, just like those of Jesus, redeem and bring grace to souls because they are united with His. We look to our Blessed Mother to show us how to do this most perfectly. She, more than any other creature, suffered in perfect union and communion with her Son. These sufferings, united with Christ's, helped redeem the world. We look to her for aid, comfort and an example. Each Sorrow is meditated upon while praying 1 Our Father and 7 Hail Mary's. 2. Now there was a man in Jerusalem, whose name was Simeon, and the Holy Spirit was upon him. 4. for mine eyes have seen thy salvation which thou hast prepared in the presence of all peoples. 6. and Simeon blessed them and said to Mary his mother, "Behold, this child is set for the fall and rising of many in Israel, and for a sign that is spoken against"
7. (and a sword will pierce through your own soul also), that thoughts out of many hearts may be revealed." 2. He said, "Rise, take the child and his mother, and flee to Egypt, and remain there till I tell you; for Herod is about to search for the child, to destroy him." 3. Joseph rose and took the child and his mother by night, and departed to Egypt, and remained there until the death of Herod. 4. Then Herod, when he saw that he had been tricked by the wise men, was in a furious rage. 5. He sent and killed all the male children in Bethlehem and in all that region who were two years old or under. 6. But when Herod died, behold, an angel of the Lord appeared in a dream to Joseph in Egypt. 7. "Rise, take the child and his mother, and go to the land of Israel, for those who sought the child's life are dead." And he rose and took the child and his mother, and went to the land of Israel. 2. When the feast was ended, as they were returning, the boy Jesus stayed behind in Jerusalem. 4. They sought him among their kinsfolk and acquaintances; and when they did not find him, they returned to Jerusalem, seeking him. 5. After three days they found him in the temple, sitting among the teachers, listening to them and asking them questions. 6. His mother said to him, "Son, why have you treated us so? Behold, your father and I have been looking for you anxiously." 7. He said to them, "How is it that you sought me? Did you not know that I must be in my Father's house?" 1. So they took Jesus, and he went out, bearing his own cross. 2. And as they led him away, they seized one Simon of Cyrene, who was coming in from the country, and laid on him the cross, to carry it behind Jesus. 3. And there followed him a great multitude of the people, and of women who bewailed and lamented him. 4. But Jesus turning to them said, "Daughters of Jerusalem, do not weep for me, but weep for yourselves and for your children. 6. For if they do this when the wood is green, what will happen when it is dry?" 7. And they brought him to the place called Golgotha (which means the place of a skull). 1. And they brought him to the place called Gol'gotha (which means the place of a skull). 2. There they crucified him, and with him two others, one on either side, and Jesus between them. 3. Standing by the cross of Jesus were his Mother, and his Mother's sister, Mary the wife of Clopas, and Mary Magdalene. 4. When Jesus saw his mother, and the disciple whom he loved standing near, he said to his mother, "Woman, behold, your son!" 5. Then he said to the disciple, "Behold, your Mother!" And from that hour the disciple took her to his own home. 6. And at the ninth hour Jesus cried with a loud voice, "E'lo-i, E'lo-i, la'ma sabach-tha'ni?" which means, "My God, my God, why hast thou forsaken me?" 7. Then Jesus, crying with a loud voice, said, "Father, into thy hands I commit my spirit!" And having said this he breathed his last. 1. In order to prevent the bodies from remaining on the cross on the sabbath, the Jews asked Pilate that their legs might be broken, and that they might be taken away. 3. but when they came to Jesus and saw that he was already dead, they did not break his legs. 4. But one of the soldiers pierced his side with a spear, and at once there came out blood and water. 5. After this Joseph of Arimathe'a, who was a disciple of Jesus, asked Pilate that he might take away the body of Jesus. 6. Pilate gave him leave. So he came and took away his body. 7. "Is it nothing to you, all you who pass by? Look and see if there is any sorrow like my sorrow. 2. Nicodemus also, who had at first come to Jesus by night, came bringing a mixture of myrrh and aloes, about a hundred pounds' weight. 3. They took the body of Jesus, and bound it in linen cloths with the spices, as is the burial custom of the Jews. 4. Now in the place where he was crucified there was a garden, and in the garden a new tomb where no one had ever been laid. 5. So because of the Jewish day of Preparation, as the tomb was close at hand, they laid Jesus there. And Joseph rolled a stone against the door of the tomb. 6. The women who had come with him from Galilee followed, and saw the tomb, and how his body was laid. 7. Then they returned, and prepared spices and ointments. On the sabbath they rested according to the commandment.